Thorntons is set to unveil a new brand identity next year after the troubled chocolate maker unveiled a steep drop in annual profits, which plunged 79% from £4.3m to £0.9m. Thorntons has been hit hard by weak consumer spending and competition from supermarkets, forcing it to announce the planned closure of 180 stores. Today (12 September) it reported its financial results for the 53-week period to the end of June. Revenue in the period dipped from £218.3m to £217.1m. Pre-tax profits were down from £4.3m to £0.9m. Commenting on the results, the chocolate maker said in a statement that its three-year turn-around plan was starting to bear fruit, pointing to a strong performance over Easter and the reduced exposure to underperforming stores. In terms of the Thorntons brands, the company said it had undertaken a "thorough review of our brand in the context of our strategy and vision to be Britain's best-loved chocolate brand making every customer smile". 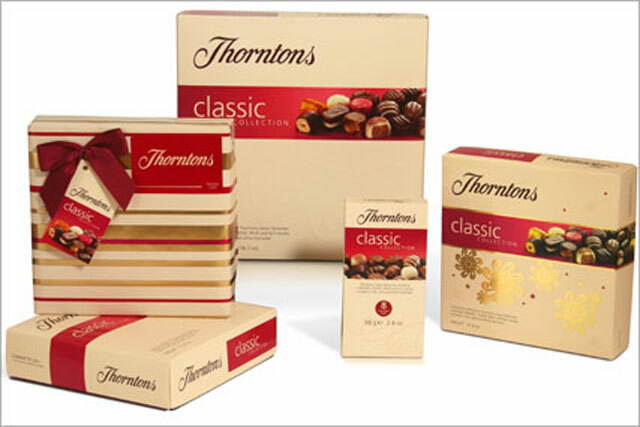 While divulging few details, Thorntons said: "We have also simplified our categories, ranges and approach to our customers which will support our activity for next year. A full review of our brand identity has been completed and will start to become visible over the year ahead. The results topped analyst expectations, as overall sales were steady. Thorntons said that online sales increased by 9.8% during the year.